In what amounts to be the biggest scandal of Hungary's democratic Parliament, they passed the law that is dubbed as "Slavery Act" by the opposition. Opposition MPs protested the Overtime Act, which the Parliament passed later, along with a law creating Minister-controlled administrative courts. The procedural invalidity of the Overtime Act could not be established according to the Hungarian Constitutional Court's decision published on Friday. The reasoning states that the situation giving grounds to the complaint made by opposition MPs resulted from the behaviour of the MPs themselves. Hungary's Constitutional Court rejected the complaint made by opposition MPs. The complaint claimed that the deficiencies of the legislative procedure (especially the voting process) by which Parliament passed the Overtime Act on 12 December 2018 resulted in the procedural invalidity of the new labour regulations. The decision is grounded on the unlawfulness of the opposition's obstruction efforts made on the 12 December parliamentary session, therefore, restoring the working order of the Parliament necessitated an instant solution. Tamás Sulyok, president of the Constitutional Court told the press that it is of the utmost importance that the Parliament remains operational, as it is the most important institution of popular sovereignty. According to the Constitutional Court, the Parliament's rules of procedure do not stipulate that the session can only be presided over from the Speaker's pulpit, as it only serves practical functions. The Court deemed not allowing the Speaker to get on the pulpit a "disruptive act contrary to constitutional principles concerning legislation." "(50) [...] Even if the civil law principle of "nobody shall be entitled to refer to their own actionable conduct in order to gain advantages" does not expressly appear as a constitutional provision, the concept of good faith and honesty permeates our entire legal system. Besides this, any behaviour aimed at unlawfully making parliamentary procedure impossible is, in essence, an act against the constitutional operation of the state. Such behaviour is unconstitutional, and as such, it deserves no legal protection, and it cannot be the grounds for the acquisition of rights, because that would turn rule-of-law on its head. The Constitutional Court cannot remain indifferent in the face of such endeavours, as the Court is the most important institution protecting the Fundamental Law, and there exists no constitutional alternative for a constitutional system based on the Parliament." The decision also states that the appointment of the opposition notary was skipped due to unavoidable circumstances in a way not ruled out by the provisions that apply to the situation. According to the Court's reasoning, the Parliament is allowed to deviate from the main rules governing the session if forced by circumstances, therefore the Speaker nominating notaries only from governing parties was legal. The Court did not find it unlawful either that an MP unelected for the function assisted the Speaker throughout the session. Conducting the machine-voting without an active ID-card recognition system did not violate the rules of procedure either according to the court, as not even the ID card guarantees that the person voting is the MP whose card is used. MPs are responsible for not voting for someone else. The decision of the judicial body was unanimous, Béla Pokol submitted a parallel reasoning. The complaint was submitted to the court by lawmakers of all opposition parties and independent MPs. They claimed that Parliament passed the law amending the Labour Code in a way that violated rules of procedure, therefore the amendment is procedurally invalid. The opposition complaint included substantive objections as well, but the Constitutional Court will assess these later, in a separate procedure. The 12 December 2018 parliamentary session descended into chaos as the opposition MPs protested the proposition that was on the agenda as an MP's individual proposal, circumventing the social discourse that is supposed to accompany the normal legislative process. The protesting MPs were later fined on the proposal of the Speaker of the House, László Kövér. 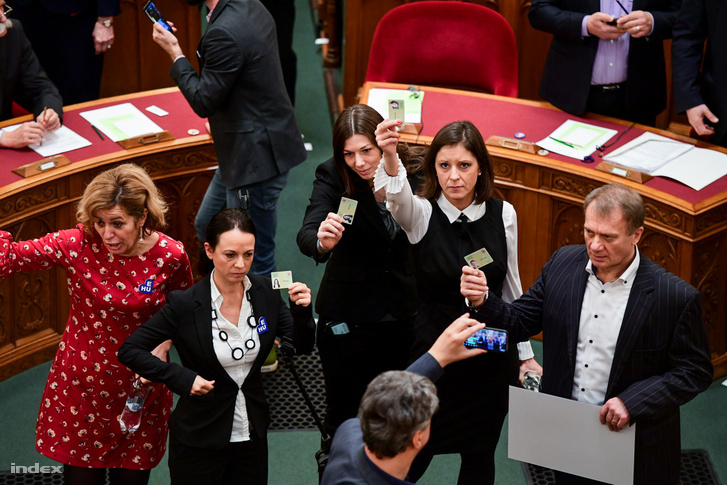 Opposition lawmakers holding up their MP identification cards during the vote on 12 December 2018. Two days before, opposition MPs tried to obstruct the legislative process by submitting 2925 (mostly flippant) amendment proposals in order to delay the final vote and prevent the new law from entering into effect on 1 January 2019. These proposals were swept off the table with a single, unified vote - the opposition MPs claimed this violated the rules of procedure. The speaker presiding over the session, János Latorcai was sitting at his place on the floor instead of the pulpit and used a handheld microphone to speak, as he could not approach the pulpit because opposition lawmakers blocked the stairs. 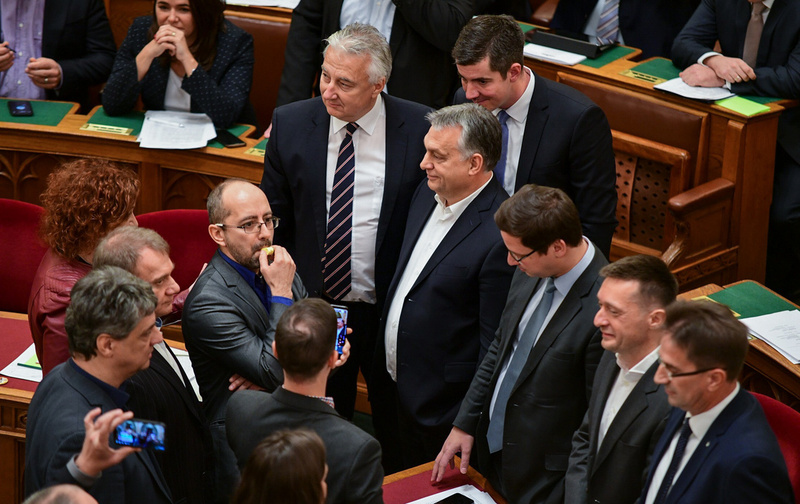 All notaries of the session were members of the governing coalition, and the ID-card recognition system was inoperational during the vote while people who were not entitled to vote were present in the chamber (such as Orbán's bodyguards), who theoretically could have voted themselves. The complaint claims that these events were in clear violation of the rules governing the parliamentary session. The presence of an opposition notary and voting transparency are such important guarantees of the voting procedure's legitimacy that without them, the result cannot be regarded as valid. 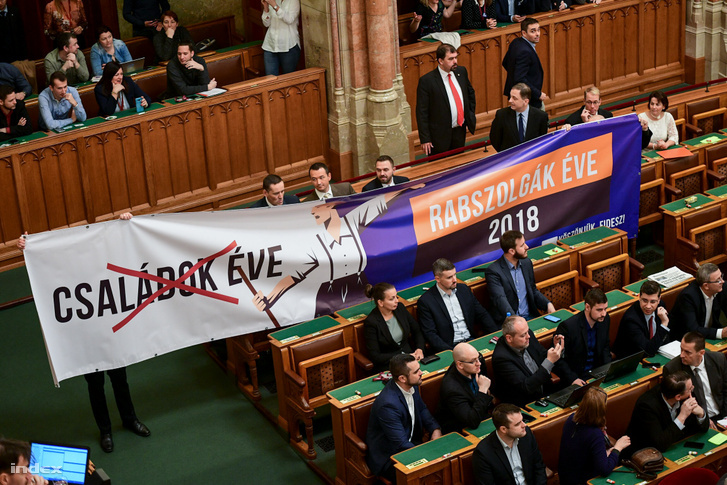 Opposition MPs hold up a sign featuring government slogan "Year of the families" crossed out and "Year of the slaves" on colours reminiscent of advertisements by the government and Fidesz on 12 December 2018. What is the Overtime Act? The new law raised the maximum allowed number of yearly overtime hours from 250 to 400 (the highest in Europe, though EU law tolerates setting a maximum of 416 hours). This may result in six-day work weeks for some. The overtime banking term could be as long as three years (instead of one year), so currently, the permissible worst-case-scenario an employee can sign allows employers to pay for overtime hours every three years. This article is the slightly amended translation of the Hungarian original published by Index.